The Protagonist: Cather Avery, an 18-year-old writer who hopes to be able to continue writing her popular fanfiction while attending her freshman year at the University of Nebraska. Her Angst: College is scary and unfamiliar, her sister doesn't want to hang out anymore, she's worried about leaving her unstable father alone - and she's developing feelings for her roommate's boyfriend. Wren: Cath's twin sister who's excited to take chances and go on adventures in college - adventures without her sister. Reagan: Cather's snarky, sarcastic but awesome roommate. Levi: Reagen's permanently-cheerful adorable maybe-boyfriend who increasingly enjoys hanging out with Cath as well. Nick: A classmate in Cath's creative writing class who starts co-writing a story with her. The Word: I'm getting worried. I'm thinking a number of authors may be secretly spying on me. Through my laptop camera, maybe? Bugs in my bookshelf? I can't be sure. But after reading another book with a heroine I related to on a surprisingly personal level, I'm getting mighty suspicious. Our heroine, Cather, is a fanfiction writer - an especially prolific and popular one. As younger teens, Cath and her twin sister Wren fell in love with the Simon Snow novels (Harry Potter with a dash of Twilight thrown in) and started writing fanfiction together - particularly gay slashfiction between Simon and his mortal enemy, Baz (a clear stand-in for Draco Malfoy). However, Cath's passion for fanfiction masks a deep-seated social anxiety that surfaces whenever she's around crowds, strangers, or unfamiliar situations. When her more confident sister Wren decides to room with someone else and discover her independence during their freshman year at the University of Nebraska, Cath feels resentful, anxious and betrayed. Nevertheless, she's determined to continue working on Carry On, Simon, her Simon/Baz magnum opus that regularly receives 20,000 hits per chapter. Thankfully, real life still has a way of dragging Cath out of her shell - especially her new roommate Reagan and her affable boyfriend Levi who decide to adopt her and correct her nerd-hermit ways. Cath slowly learns to integrate into regular college life - but she still has a bipolar father to worry about, a growing attraction to a fellow classmate to mull over, and a creative-writing professor to impress who does not appreciate the literary merit of fanfiction. I found Cath to be an intensely relatable and authentic character. She's socially inept and adapts slowly to new situations, and her fear of change permeates the novel. Her whole life is about finding comfort in the familiar - part of the reason she loves writing fanfiction is because it allows her to remain in the world of Simon Snow long after the author stops writing about it. One of the most poignant conflicts in the novel comes from Cath's discovery that her twin sister (and former co-author) has moved on from the Simon Snow fandom and actively pursues a life without her. Some of my appreciation may derive from my own bias because I had a very similar adolescent experience - social awkwardness, comforting routines, more adventurous sisters and all. 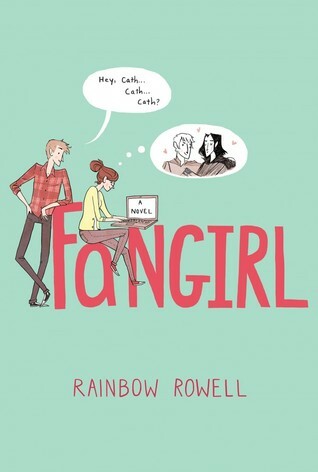 Of course, Fangirl is also a canny examination of the creative process, as Cath has to juggle her fanfiction schedule with the original material she's expected to produce for her Creative Writing class. This cleverly ties into Cath's struggle between familiarity and progress. She can easily churn out thousands of words a night on Simon and Baz's budding romance, but writing her own fiction, with no built-in parameters or pre-established worlds, is a much more daunting experience. Rowell wisely refuses to downplay the legitimate creativity and effort required to write fanfiction, but also shows how it can be a bit of an artistic security blanket. Rowell deftly weaves these related themes together with a bright and deceptively light writing style. Her depiction of fandoms and fanfiction is hilariously spot-on (especially with the titles of Cath's fics, which precede every chapter) and the novel maintains an upbeat and knowing tone even when dealing with darker material (such as Cath's father's mental illness or the intrusive presence of her estranged mother). Fangirl is a heartfelt, funny, and eerily accurate depiction of how fiction is created, celebrated, and interacted with in the 21st century. Yes, yes and everything yes on this. Thoroughly enjoyed this unexpectedly poignant read. I was initially hooked by the Simon/Baz slash (which I'm hoping some other fan is writing more fanfics about out there) but eventually fell in love with the chars and the story themselves. Thank you for the recommendation! No problem! Now I want to read her other stuff - like ELEANOR AND PARK and THE ATTACHMENTS!